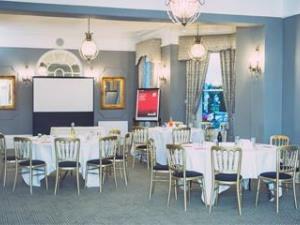 Best Western Lansdowne Hotel Conference residential venueBest Western Lansdowne Hotel occupies a premier position on Eastbourne's uncomercialised seafront overlooking the Western Lawns and Wish Tower. The Hotel is privately owned and has been in the same family ownership since 1912. Best Western Lansdowne Hotel has had many years experience of arranging residential training courses, conferences, seminars and meetings. The management and staff have therefore acquired a comprehensive understanding of the organiser's requirements. For special occasions, whether it be a small gathering for a finger buffet or afternoon tea in one of our sea view lounges or a private 3 course lunch or dinner in our banqueting restaurant the Lawns Room, if you're organising a birthday party, wedding anniversary celebration or even a work Christmas Party, the hotel has a variety of options to cater for your needs and budget. Used as 2nd restaurant and function room. Used for evening receptions and dancing, lower ground floor, some natural daylight, dance floor, stage, WiFi, private bar. Used for small meetings, natural daylight. Used for coffee meetings/receptions, natural daylight, WiFi, sofas & armchairs. Main hotel restaurant, natural daylight. Can be used privately or as art of the main hotel restaurant. Eastbourne is 65 miles SSE of London, the main approach roadbeing the A22. The Brighton By-pass, the A27, provides a good access from the west, whilst the M23/A23 and on to the A27 (Lewes By-pass) to Polegate makes an alternative route from the M25. Southern Rail operates direct train services every half hour during the day from London Victoria with a journey time of just 90 minutes. National Express operates a daily coach service.